eNLokam: World’s first artificial leaf!!! 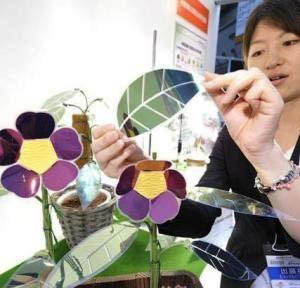 Here comes the world’s first artificial leaf! Scientists have created the world’s first practical artificial leaf that can turn sunlight and water into energy. A team of researchers at Massachusetts Institute of Technology is behind this astonishing invention. According to them the artificial leaf from silicon, electronics and various catalysts which spur chemical reactions within the device, can use sunlight to break water into hydrogen and oxygen which can then be used to create electricity in a separate fuel cell. For their research, the scientists identified a set of inexpensive, common catalysts including nickel and cobalt. The lead researcher was Daniel Nocera. They claim this could pave the way for a cheaper source of power in developing countries like India. Let’s wait for a day when each home has its own power station. Let’s imagine, the villages in India and Africa not long from now purchasing an affordable basic power system based on this technology! Who said technology is not for the needy?!! !